Despite my (pretend) hatred for Canada, I seem to keep finding some really tight Canadian metal bands to make me realize that the land of Nickelback can actually produce some most excellent groups. 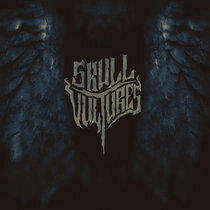 Today's offering is the surprisingly destructive Skull Vultures, a Vancouver death metal group who blast their way into oblivion with harsh vocals and groovy bass lines. Skull Vultures are exciting because they mix in all sorts of proggy elements to their death metal attack, allowing this two man project (Although I assume they employ more musicians for a live and studio context) to really latch into your brain. Sure, they are primarily a death metal band, but as Only Darkness proves, they're not afraid to bring touches of sludge too. There is something strangely mesmerizing about the angular riffs on tracks like Reclaim though. It shows the bands ability to craft something unique and even a little bit frightening in the blissful void that death metal can create. This creative duo has been able to craft something unique and inspiring, heavy metal that establishes a new set of rules and paradigms. Though it fits in with the old guard, Skull Vultures seem to be pushing the envelope into a brave new world.